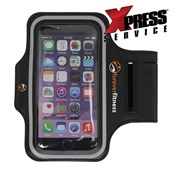 It's easy to appeal to the gym crowd with sport armbands, now available for customization! These brandable armbands offer access to the headphone jack, key holder pocket, an adjustabl Velcro strap, and sweat resistant material. They're the perfect company gift, giveaway, or prize item for conventions, trade shows, or company events. Customers won't throw these high perceived value gifts, ensuring your logo and brand will be on their minds for years to come.